Few things if any compare in luxury and beauty on the water like the 87’ Weaver “Mantra.” The perfect vessel when it comes to entertaining guests while docked at night at exotic destinations or cruising in cool blue waters. A pedigree sportfish yacht like no other combining power, relaxation, entertainment, and opulence. The envy of all when buying a boat with luxury details and options all around, from the staterooms, entertaining areas, electronic equipment, and fishing accessories. All things are possible and available when it comes to this luxury yacht. The 87’ Weaver “Mantra” boasts an impressive master stateroom which includes rich cherry woodwork throughout. A walkaround king berth provides exceptional comfort to sleep as well as ample storage room underneath. A Samsung flat screen TV faces the bed and the custom leather sofa area for easy viewing. Accent rope lighting and recessed lighting illuminates the room ensuring that everything is well lit. Most importantly, there is private access to the master head with many beautiful amenities, such as custom wood flooring, and Corian countertops. Guests will enjoy the VIP Stateroom and all its offerings including wool carpeting and gorgeous cherry wood. A queen berth with plenty of storage capacity gives guests more than enough room to walk around surrounded by luxury. The room also has a 42″ Samsung LCD TV. The VIP head comes with full amenities and a relaxing shower when washing down from a long day of fishing or preparing a fun night out. Located amidship there are two guest staterooms. Each guest stateroom contains four oversized single berths and plenty of storage room for each guest’s comfort. Not to mention there’s a guest head and a day head with showers and amenities. Guests will feel welcomed and at home by the gorgeous wood accents and full bathroom. 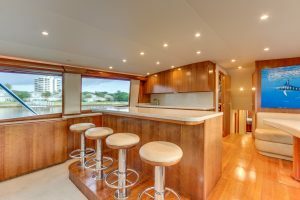 The salon and adjoining galley make the perfect place to kick back and entertain guests. The salon has ultra leather sofas and a custom stationary mount cherry coffee table. For live entertainment and music, there’s a 50″ Samsung TV, Bose Surround Sound System, and computer system. The galley features 4 Bar Stools, and corian countertops and sink. When it comes to the food and drinks, the Galley has everything you could want and need. The appliances include 4 SubZero refrigerator drawers, 2 SubZero freezer drawers, wine chiller, ice maker, Kenyon 4-burner cooktop, and a GE microwave. Without saying, when it comes to fishing, the 87’ Weaver “Mantra” comes very well stocked. 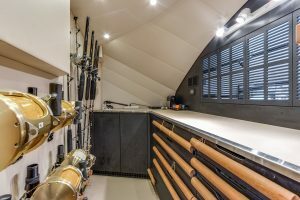 Forward of the salon is a custom tackle room with rod storage for the crew and anglers to easily prep. 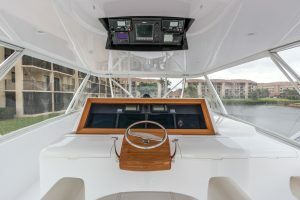 The enormous cockpit is both elegantly furnished and well detailed for sportfishing. Options include four tuna tubes to keep bait alive for just when you need it, a large and easily accessible stainless-steel bait freezer, tackle drawers for all tackle storage right at hand, rod holders, a Release Marine teak fighting chair with an oversized seat, and a teak deck. 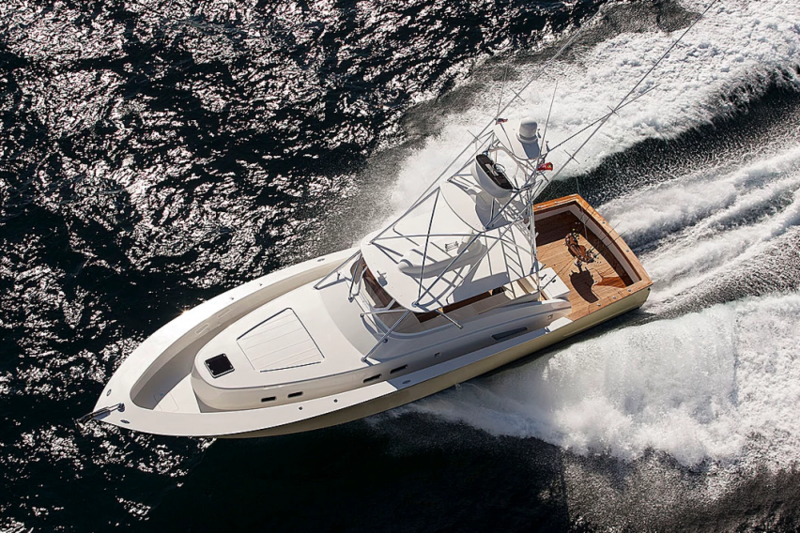 All the bests options and more you’d expect from this luxury sportfishing yacht. 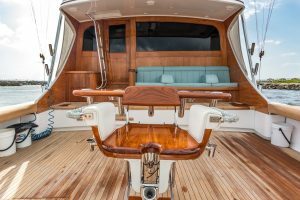 When it comes to Weaver Yachts, only the best equipment and luxuries will do for the Captain and his or her guests. The Flybridge on the “Mantra” provides a massive space with a 360-degree ocean view. 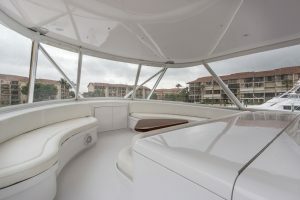 The helm boasts two helm chairs, MTU displays, and a custom console which houses state of the art electronics. 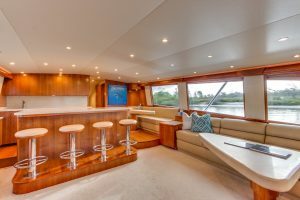 Ahead of the helm is an area with seating for 12, a teak table, and a roomy custom stainless-steel freezer and drink box. Storage too, of course, is plentiful for all fishing and safety gear. Comfort, without the proper and top of the line navigation and electronic equipment, means little. A brief summary of the electronics package includes (2) ICOM IC-m602 VHF radios, a Furuno Radar with 25kW open array scanner antenna, a Furuno NavNet 3D GPS / Chartplotter, a Furuno FCV-1200 with 17″ VEI monitor, and a Furuno CH250 Chartplotter. Ensuring you can travel wherever you need reliably, efficiently, and safely. The tower electronics include an ICOM IC-M402 VHF and a large radar pod. Electronic details are what makes this luxury yacht stand out amongst all others. When it comes to getting to where you’re going, the power and efficiency of the 87’ Weaver “Mantra” are without comparison in customization and detail. 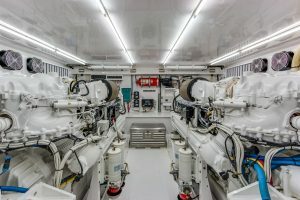 With Twin 2600 HP Detroit MTU engines with 2.034:1 ZF gearboxes 3060A, there is more than enough power to get to those far and beautiful destinations or to troll for billfish, tuna or mahi. The yacht was built specifically for long-range destinations, marking its ability to run on a single engine at a time for maximum efficiency. At trolling speeds, this Weaver can travel approximately 4000 nautical miles with ease. 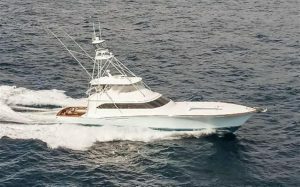 The 87’ Weaver “Mantra” is a sportfishing yacht like no other. 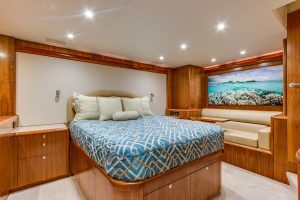 This yacht brings together luxury and craftsmanship with all the comforts and relaxation one could want while also providing all the entertainment and fun to be experienced while out at sea fishing with friends and family. We at Macgregor Yachts are passionate and dedicated to bringing you quality and expertise when buying a custom sportfish yacht. 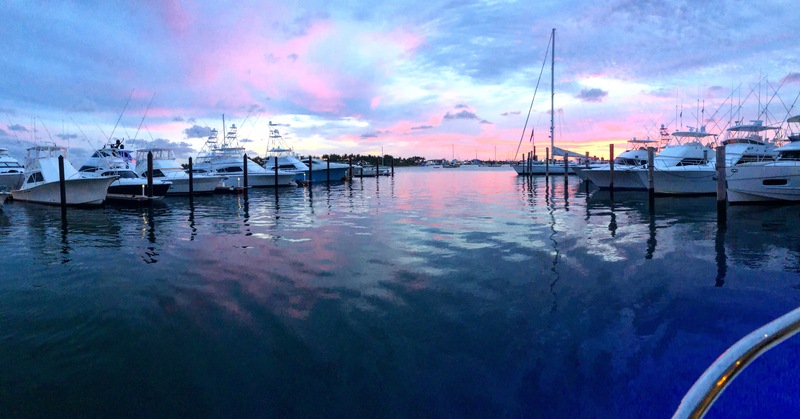 As a brokerage with over 20 years of experience, our team of experts are here to help you find the luxury yacht you’re looking for. For more information on the 87’ Weaver “Mantra” or any other of our pedigree sportfish listings call us today at (561) 799-6511 or visit our website by clicking here!